Our client is one of Australia's leading listed healthcare companies. For over 30 years they have been providing quality, affordable and accessible healthcare to the people of Australia. They have an expansive network of multi-disciplinary medical centres, pathology laboratories and diagnostic imaging centres. They have over 70 surgeries across Australia and are currently recruiting for a number of GPs around all the major cities and in some beautiful rural locations. Because they have so many practices you will be able to do 6 month rotations within non DWS locations. For GPs who would prefer to be based at the same location rather than do rotations there are opportunities in DWS locations. The practices are well established with large patient bases and supportive, experienced teams that will help new GPs settle in quickly. Senior members of the management team are UK GPs with over 20 years of experience. Most clinics have opening hours from Monday to Friday, 7am to 10pm and weekend opening hours, 8am to 10pm, for 365 days per year including public holidays. Minimum of 40 hours per week, comprising of 1 evening shift (6pm to 10pm Monday to Friday) and 1 day on the weekend OR 1 day every alternate weekend. Sydney is a vibrant and cosmopolitan city, home to a mix of arts and culture, fantastic restaurants, exciting nightlife, some of the world's best beaches and a rich cultural heritage. It is a wonderful city and a destination that it is very hard not to fall in love with. Australia's oldest and largest city is set on one of the world's most stunning harbours, fringed by easy-to-reach, sandy beaches. The city has a sunny, moderate climate which contributes to Sydneysiders' relaxed lifestyle and love of the great outdoors. 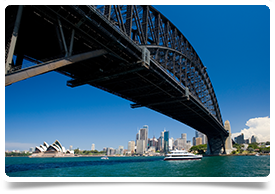 Sydney offers a secure environment for families, with excellent facilities and transport.